October 7, clear blue sky, 80, wind NE 10. The stong fullmoon tide and cooler NE breeze created excellent conditions. We started finding perms immediately, and a good pair appeared at 2 o’clock, working along a vivid double prop scar. Cast too hard, the fly kicked right, and it crashed down on one of the fish. Adios! Poled over to an adjacent grass flat and spotted another happy pair at 1 o’clock. This time got the crab fly in the zone, and the left perm tailed on it but didn’t take. Albert told me to “hop it,” gave the fly a twitch, and the permit vacuumed it in. Came tight and disaster loomed—fly line was caught on the bow’s raised casting platform. Scrambled to free the line, which popped loose just when it felt as if the leader would break. An old lobster buoy and line were the next obstacle. The perm got around it, and I could feel the extra tension. Albert jumped on the engine and moved us close, and I gingerly freed the line with the fish still attached. The rest was anticlimax, and we brought the 12-pounder on board. Big bonefish are the real fall prize. Up the road in Islamorada, anglers have taken multiple record fish of 14 to nearly 16 pounds in late September through November. In the Middle Keys, the bones are rarely that large, but the big boys do come out to play because of the tides. The area holds numbers of banks and bars that look great but don’t hold bonefish until the fall tides. A few inches of extra depth, the difference between 2 and 21⁄2 feet, shouldn’t mean that much, at least to human senses. To flats denizens, however, it makes all the difference in the world. One long, sickle-shaped flat near Marathon appears to have everything a bonefish could want: productive, light coral–spongy bottom, proximity to deeper green water, and hard currents. Half a mile to the west is a set of banks that host bonefish and permit year-round. Yet the fish barely use the sickle bank except during four short periods in late September and October coinciding with the full and new moons. Then doubledigit bones appear, ready to eat. Every season I have to hear about these torpedoes from Albert, Bus, and Rich, but the damn flat never produces for me. The difference between bonefish fly patterns anglers rely on in the Upper versus the Middle Keys is interesting. Between Biscayne Bay and Islamorada, where bonefish are notoriously finicky, dedicated tiers have created a wealth of natural buggy-looking flies to try to fool these fish. Tim Borski’s fine patterns exemplify this approach, and Upper Keys fly flingers routinely throw his Butterflies, Sliders, and Chernobyl Crabs at big, wary bones. 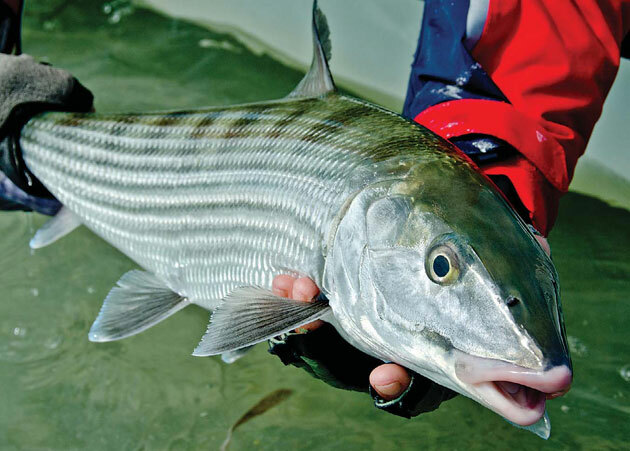 Anglers aghast at the prospect of presenting a gaudy Gotcha or plain-Jane Clouser to a bonefish also use the Kwan—blending elements of a Toad, a Merkin, and a shrimp pattern—around the upper islands. Below Long Key, something must change. On a Grassy Key flat named for a defunct bar, Bus found us some bones. Two tailed simultaneously 60 feet off the bow, and I put a fishy-looking Kwan just in front of them and midway between the pair, expecting a quick take. Instead, the fish took one look and boogied off. Another morning, a large backcountry bone was oozing around in the shallows, showing a big dorsal fin and broad, dark back. I softly landed a Butterfly in front of it. When the bone got near, I gave the fly a seductive slow pull, and the fish freaked out. This has happened repeatedly in and around Marathon with these great-looking flies. When we want to catch a bonefish, the weapon of choice is the antithesis of the buggy Islamorada flies: a size 2 Gotcha. And not just your regular run-of-the-mill pink Gotcha, but its “red-headed” cousin featuring a bright, hot red–pink head and gold Krystal Flash tail. The venerable Gotcha comes from Andros Island in the Bahamas, where Jim McVay concocted the original pattern more than 30 years ago. The pattern’s coral-pink head, diamond-braid body, pearl-flash tail, and tan-gold Craft Fur wing devastates Bahamas’ bones. However, on Andros Island’s Middle Bight, Captain Leslie Green and the guides at the Mangrove Cay Club wanted a fly with bolder colors, so they tweaked it to add a red head and gold tail. We tweaked it again to create a version with a hot pink head. It’s a killer there and on Middle Keys bones. Albert and Rich adopted it in short order, and it’s the rare Middle Keys bonefish that refuses it. Captain Bus, with his traditionalist streak, still opts for the plebeian brown-and-white Clouser, which also catches lots. Why these two patterns work so well among the middle islands, but the artistic buggy flies don’t (at least, not for me), is just another intriguing mystery. Fall weather produces its share of cloudy overcast days and persistent showers or rain. As these are frequently nontropical systems, the wind isn’t blowing hard. A visiting angler might despair, but the savvy local does not. Keys bonefish—those still around—adore this weather. Visibility can be acceptable under dark skies, but if not, fill the live well with shrimp and resort to the backup plan: chumming. Find a white, sandy spot or hole with good current. Stake or anchor 45 feet away, break up a dozen shrimp, and pitch the pieces into the hole. Stand ready on the bow with fly in hand. If bones are in the neighborhood, you should know it in 15 minutes or so. Ghostly shapes will dart into the hole, attracted by the scent and the edible bits. Fire in a Gotcha, strip once or twice, and a hookup is a very good bet. Of course, there’s none of the stalking that makes bonefishing a great game. But when Mother Nature denies that opportunity, a bunch of fly-rod bonefish in nonclassic circumstances beats a stick in the eye or a day at the bar. A “dark” secret of early bonefishing was reliance on chumming. It was the method used by pioneers like Harry Snow Sr. The same was true farther north, where legendary captain Bill Curtis pioneered bonefishing in Biscayne Bay. Forty years ago, many freshwater fly- fishing luminaries, eager to catch the gray ghost, came to Miami to fish with Curtis. Rather than hope these saltwater beginners could see the fish and make the needed cast, he often set them up on a sand hole and chummed. His fly of choice was his Blue Flash, an attractor pattern that has fallen into disuse (at least in the Keys). Overcast days can also be magic for junior tarpon. The little guys love low-light conditions, and on bright summer or early-fall days, fishing for them is done by 9 a.m. Roll in the clouds, cover the sun, and fishing can be prolonged for hours. Low light can also make the fish willing to take surface flies like foam-backed Gurglers. Dry-fly fishing for tarpon is highly entertaining, although not the best way to ensure hookups. When the tarpon’s head comes out of the water, this tends to push flies away (remember the four-bite tarpon?). Strikes are spectacular, though, and worth a lot of missed fish: Before the cold fronts begin to roll again, water temperatures slide, and tarpon leave for deep water, anglers can still find a few big resident fish in the backcountry. October tides flood many of the grassy basins and attract these residents. There’s one last chance for laid-up poons. I like the symmetry: tarpon season opens with laid-up fish in late winter to early spring and closes the same way in the fall. Don’t let anyone convince you all the big ones are gone during this season. For the visiting angler, fall is the season to start and build a relationship with a Keys guide. Calling four-star guides early in the year for prime spring dates produces marginal results. Guides like Albert, Bus, and Rich—and other top Marathoners such as Scott Collins and Chris Morrison—are booked months or years in advance for the spring. A better approach is to line up a great guide in the slower fall months. Enjoy the fine unappreciated seasonal fishery, meet a good guide, and get on his dance card. 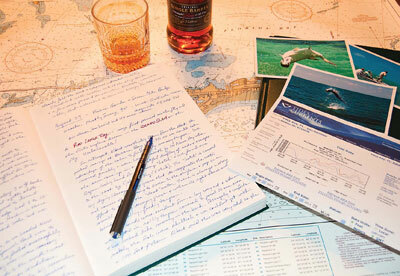 When prime spring or summer dates open up, you’re on the list to get a crack at them. Buy Seasons on the Flats in the MidCurrent Store. 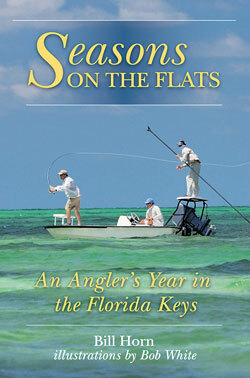 Excerpted from “Seasons on the Flats” (Stackpole Books/Headwater Books, August 2012, 160 pages). Copyright © Stackpole Books 2012. All rights reserved.